No treats for the networks on Halloween night. CBS: The network affiliate in Minneapolis aired the simulcast of MONDAY NIGHT FOOTBALL, so the numbers may be adjusted downward this afternoon. But even with that potential boost, KEVIN CAN WAIT is currently down 0.3 to 1.4, and MAN WITH A PLAN is down 0.1 to 1.5. 2 BROKE GIRLS (1.5) and THE ODD COUPLE (1.2) are up 0.1, and SCORPION is up 0.2 to 1.4. NBC: THE VOICE plunged 0.7 to 2.0, and TIMELESS fell 0.2 to a new low 1.1. 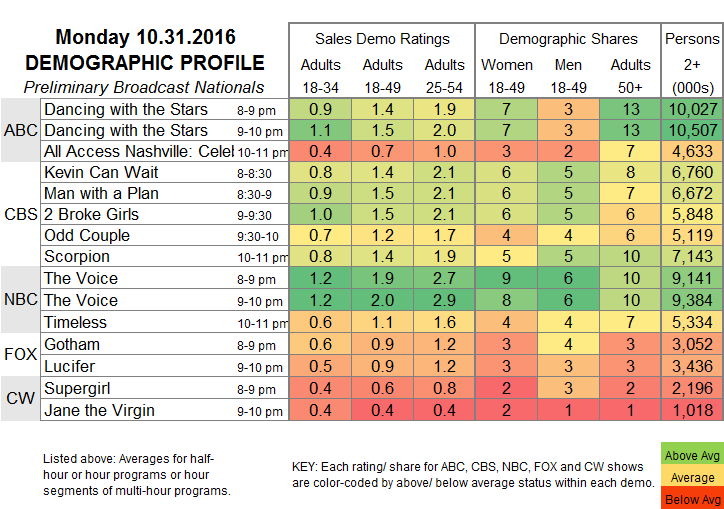 FOX: GOTHAM dropped 0.2 to 0.9, and LUCIFER was down 0.1 to 0.9, both series lows. CW: SUPERGIRL is already looking like an ordinary CW show, down 0.2 to 0.6. 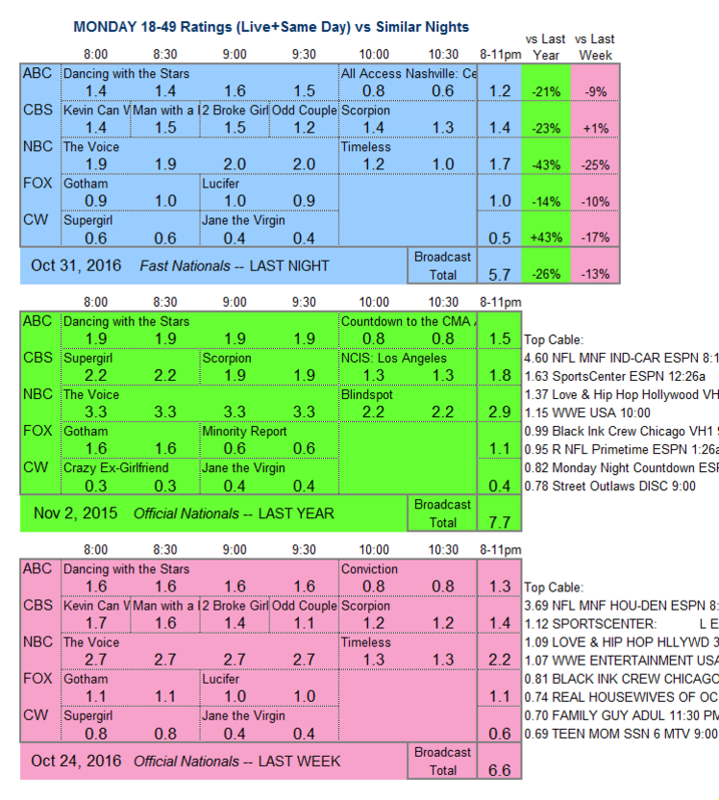 JANE THE VIRGIN, which aired a much-hyped, premise-changing episode, was steady at 0.4. ABC: DANCING WITH THE STARS was down 0.1 to 1.5. The ALL ACCESS NASHVILLE special did even worse than the flop CONVICTION, lower by 0.1 to 0.7. The WORLD SERIES returns to FOX tonight for Game 6. In addition, FX airs the season finale of its acclaimed (and successful) ATLANTA.